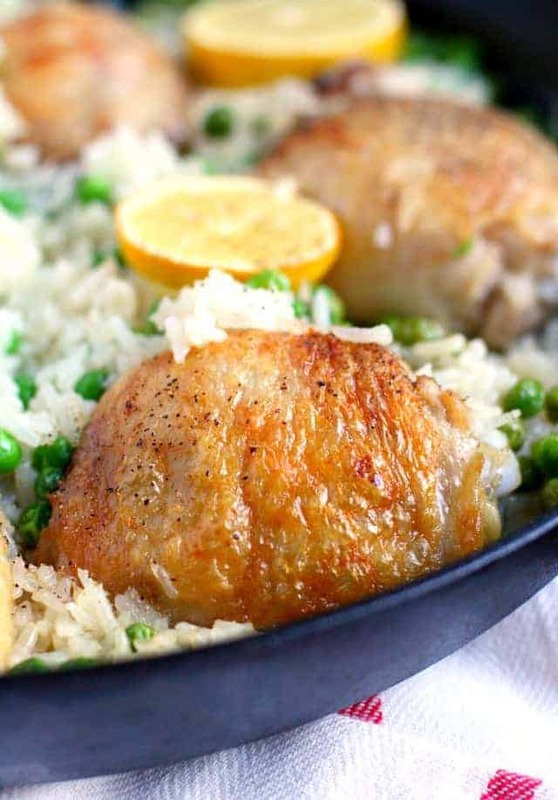 Home » Main Dishes » Easy Skillet Chicken and Rice (Gluten Free, Dairy Free). Simple and tasty comfort food – this easy skillet chicken and rice is a family favorite. An easy gluten free and allergy friendly dinner recipe, that’s sure to please kids and adults alike! Do you ever feel like a short order cook? One child wants chicken tenders, the other would like mac and cheese, and you and your husband want something a little more adult. It’s frustrating, isn’t it? Wouldn’t it be nice to be able to make just one meal at dinnertime? One meal that would satisfy everyone – kids and adults alike. A comforting meal that would make your family come running just because it smelled so good while it was cooking. Oh, and by the way, it should be free of gluten, dairy, eggs, soy, nuts…oh, let’s just make it top 8 free, shall we? This comforting skillet chicken and rice is just that kind of meal. Now, I can’t guarantee that your whole family will love this meal, but it is simple enough to satisfy even the pickiest of palates, and it has enough flavor to keep the adults interested, too. 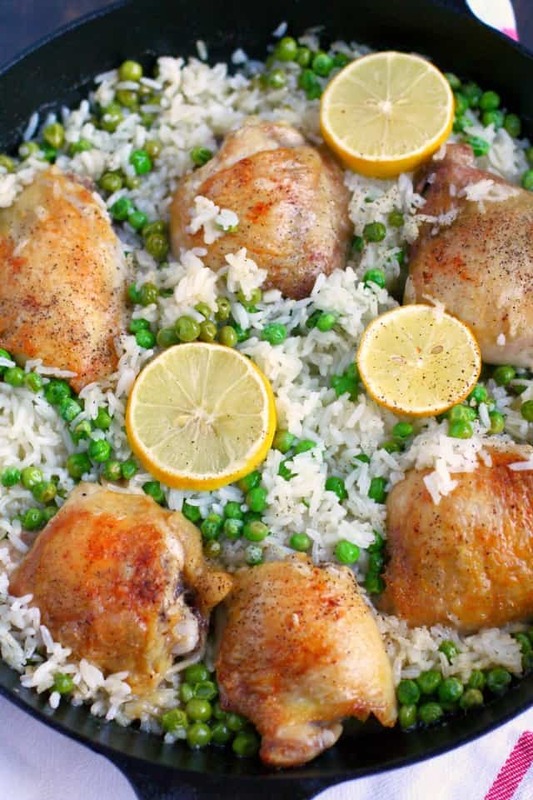 Crispy chicken thighs and lightly seasoned rice and peas make a tasty meal that’s perfect for the cooler weather. And it’s affordable, too! 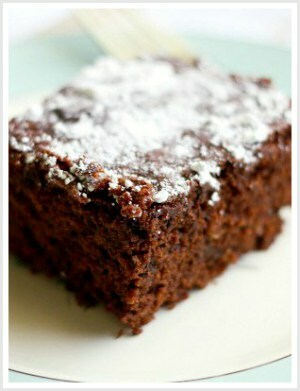 No fancy ingredients in this recipe – these are simple, healthy ingredients that are naturally allergy friendly. What is the best pan to fry chicken in? I like to use a cast iron skillet to crisp up the chicken skin. For this recipe, it works really well to use cast iron, because you can brown the chicken and then put the whole skillet in the oven to finish cooking everything. What can be used in place of rice? You could try quinoa, millet, or probably even cauliflower rice! How do I make the skin on chicken thighs crispy? Make sure you heat the oil in the pan first, and let the pan get really hot. Once the skillet is hot, add the chicken. If your pan isn’t hot enough, the skin will just kind of stick to the skillet and it won’t look as pretty and brown and crisp. 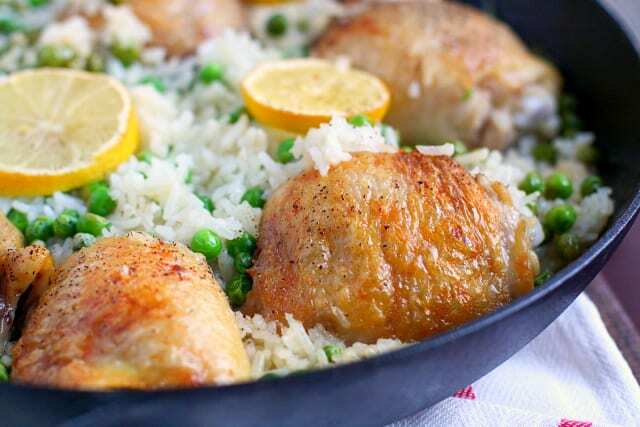 Easy Skillet Chicken and Rice. 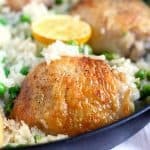 An easy and tasty dinner - skillet chicken and rice is family friendly and delicious! While the rice cooks, start the chicken. Heat the olive oil over medium heat in a cast iron (or other oven-safe) skillet. Once the oil is hot, add the chicken thighs, skin side down, and cook until the skin is golden brown. Flip the thighs over and cook over low heat. Slice the lemon in half. Set one half aside, and cut the other half into thin slices. When the rice is done cooking, add it to the skillet, distributing it around the chicken thighs. Pour in the chicken broth and peas. Squeeze the lemon juice over the pan, and lay the lemon slices on the rice. Sprinkle with salt and pepper. Bake at 425 degrees for 25 minutes, then turn the heat up to 450 degrees for the last 5 or so minutes (so the skin gets nice and crispy). Check the temperature of the chicken using a meat thermometer - it should be 165 degrees. To serve, spoon rice onto each plate, and top with a chicken thigh. You can easily increase this recipe - if you need to double it and a skillet isn't large enough, simply transfer to a large Pyrex dish after browning the chicken. Leftovers should stay fresh in the refrigerator for three days. This post was originally published in October 2016. It has been updated. 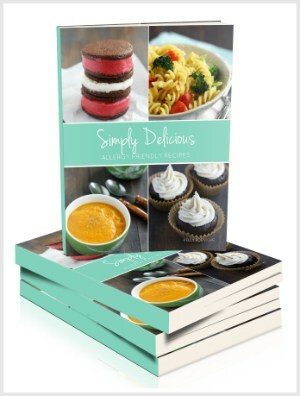 « Zucchini Spice Cupcakes (Gluten Free, Vegan). This is now a staple in my home and my extremely picky two year old even approves! Thank you so much! Oh my gosh this recipe was just what we needed. We just found out that our 2-year old daughter has egg, milk and peanut allergies and have been desperate to find good recipes. I am so glad that I found you! So glad you are here, Deanna! 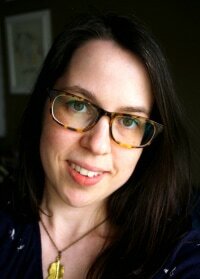 My son has been allergic to dairy, peanuts, tree nuts, and bananas since birth and has IBS, too. He has outgrown his egg and soy allergies now that he’s almost an adult. I don’t know what I would have done without chicken and white rice! Even today, it’s his favorite food combination. We use vegan margarine and olive oil for regular cooking and grapeseed oil for frying at high heat. I usually cook white rice in chicken broth, but I won’t need that with this wonderful recipe from Deanna. Love that it uses dark meat chicken and has so few spices since spicy food upsets my son’s stomach. Thank you for the recipe! Do you think this would work with frozen corn in place of the peas? My son is allergic to peas and is the pickiest of eaters, but I think he would enjoy this dish. 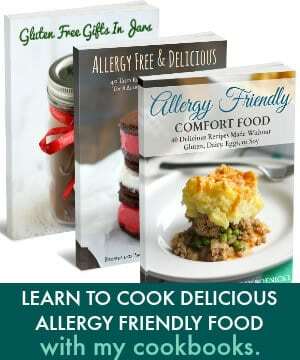 Your recipes are fabulous and have been a life saver for our allergy family. Thank you so much! Sure, corn is a great substitution! This is the type of meal I could eat every single night…I’m obsessed with both chicken and rice in all forms and somehow could eat the two together over and over on repeat. Loving this easy, healthful, comforting dish!